In the previous lesson, you have learned how to play against a continuation bet. 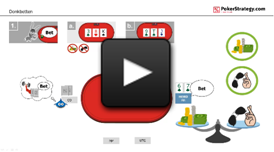 In this lesson, you will see how to proceed in other spots when you were not the preflop raiser. You can either take the initiative yourself by donk betting out of position, or have it given to you when your opponent decides not to c-bet. Finally, you can end up in an unraised pot. All of these possibilities will be covered in this unit. It will still be assumed, except for the part on unraised pots, that the pot is heads-up. The first decision you can face is whether or not to donk bet. In general, you should avoid donk betting on dry boards. They don't hit your perceived range, so such a donk bet is not believable as a bluff. And if somehow the board has actually hit you, there is no need to bet for value as your opponent will most likely do it for you. On a wet board, you should, as a default, donk bet with a balanced range containing good draws and monsters (two pairs, sets, etc.). However, if you are facing a good thinking opponent, he will expect your range to be strong. A good thing to do is to depolarise and weaken your donk betting range – you can now bet all hands you don't want to check/fold – basically any pair or better, and any draw including gutshots. That way, you get more value for your good hands, and it is easier to defend the weaker part of your range. If you check, your range is capped so it can easily be attacked. Against a knowledgeable opponent who can take advantage of that it is better not to leave any hands you don't want to be under attack within your checking range. As a default, you should avoid donk betting on dry boards. Donk bet on wet boards with a balanced range of good draws and monsters. Against a good opponent, you can donk bet (again – mostly on a wet board) with any hand you don't want to check/fold with. Bet out with a pair or better and a gutshot or better. Who wrote this article? Phil Galfond? It is awesome, awesome. It has to be memorized word for word. Excuse my enthusiasm. Regs beware, recreationals attacking your stacks... :-).